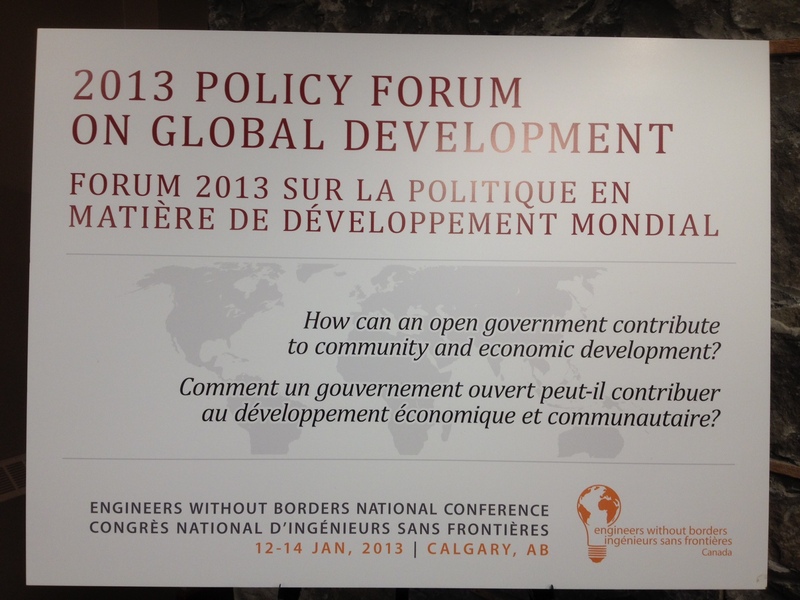 16 thoughts on open government and community and economic development | Wait... What? « Why should you be holding a computer mouse? I live in Argentina, and I am afraid that the whole concept of Open Government is rather impractical if you have tribalism and pork-barrelling (as is the case in most of the world). Here our papers (La Nacion in particular) are champions of Open Data. We have some of the most downloaded infographics in the world, way ahead of anything out of the United States. The only paper doing higher volumes on individual infographics is the Guardian in the United Kingdom. It makes absolutely no difference to the way we are governed. Our government actively suppresses economists who question the inflation figures their central agency generate, and shuts down the economics units of regional goverments that come up with contradictory findings. The official inflation is sub 10% p.a., actually it is somewhere above 25%. The government line is that business is to blame for continuously raising prices. But sequestrations (e.g. YPF nationalised from Repsol without compensations) have raised our country risk to the 2nd highest in the world. Businesses are trying to amortise their assets faster because it is risky doing business here. So we get inflation. Our tax burden has increased from 17% to 31% of GDP in the last 10 years. Most of that has come through increased Value Added Tax and social charges on employment, because it was going to be too controversial to increase property taxes or income taxes. There is no meaningful probability that any other government will be elected to take a different approach. The most that anyone can imagine is a change of power from the current ruling presidential clique to another chieftain. There is a huge proportion of the population, concentrated in the largest cities, who are dependent on the government for handouts and value their policies of keeping bread and meat cheap. They are never going to vote for any other party. And there are plenty of intellectuals in Argentina, Ecuador and Venezuala who don’t think that business effectiveness is important and have a Marxist analysis of national progress based on autonomy. 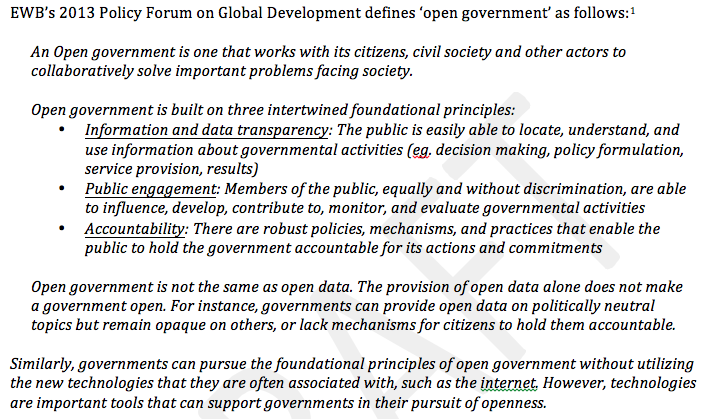 Open Data is not a panacea. Engaged and critical citizens are not sufficient to ensure debate. It would be far better to have an impartial and well-educated civil service with long term policies, closed data, and a broad consensus in the population on the direction. Great post. I recommend forwarding to Minister of Service Alberta and Associate Minister of Accountability, Transparency and Transformation–as they are spearheading open data and government for our province. Hi Linda, I think there are two points that you raise that are worth re-iterating. The first is citizen trust in their government. The UK has one of the most open governments in the world (anyone who fancies wading through reams of financial information is welcomed with open arms!) but there are daily reminders in the newspapers of just how far off good governance our lot are. This means that citizen trust is low, and that the average person is pretty disengaged with our political system (ie. all politicians are corrupt so what’s the point). And rather than open gov data being used to engage and support us to hold the government to account, the overwhelming use of the data is to ridicule the government in the media, which perpetuates the lack of trust. So a bit of a catch-22. The second (and more positive) point is about getting people to interact with the information. In the UK I remember that one of the first ways the general public started to engage with government data was around transport. The government opened up their data banks on public transport networks, and developers built apps which allowed you to see which London bus you needed to get from A to B. Some committed individuals also worked with the Freedom of Information Act to collect, analyse and communicate juicy government data on their own topics (waiting lists for allotments was one of my favourites) in the wilderness days before our beloved Guardian DataStore became the place to go. Neither of them really tick the ‘holding governments to account’ checkbox, but both are good examples of audiences and data meeting in somewhere in the middle and creating interest in the potential for open governance (rather than open government). I’d like to think we’re starting to see this in Kenya, where an increasing number of apps are being produced and circulated that make open gov data useful to the average citizen. It’ll be interesting to see how this access to data bumps up against citizen activism as we enter the run up to the election in March, and whether it does lead to more government accountability. Keep an eye on the Uchaguzi and iHub Nairobi websites for more info. Matt’s critique is another iteration of mine. Looking at the dynamics of the matter of poverty through the lens of “Open Credit” is, systemically, more accurate. Within the linguistic construct of “Open Government/Data/Development/IATI”, systemically, credit creation is economic tribalism. As such, “aid” functions as a loyal oppositional force and a positive feedback for increasing and deepening poverty. CapitalismFail, with its fiat, debt-based currencies, has facilitated and demanded a planetary scale collapse of the climate of the Holocene, and given us the Anthropocene with its near-term extinction event. with the summer ice gone from the northern hemisphere’s “ice box” (~70% loss in 30 years; a statistical 100% loss within years (less than a decade), the Arctic carbon, that was refrigerated, is now spoiling and reentering the active carbon cycle. This is in conjunction with peak conventional oil effecting peak credit. Points #6 & #8 are particularly relevant. To the degree freedom is responsibility, property (wealth) is responsibility, and power is the right to be irresponsible, more than a speck occupies the eye of the beholder of the environmental, social, and economic injustice of CapitalismFail regarding the systemic matter of impoverishment about which aid NGOs and national governments’ aid agencies labor to understand, model, and mitigate. To the degree “stupid is what stupid does”, and “it’s the climate, stupid”, does our breed of our species need renaming? Are we, the pious fossil carbon elite of homo sapiens sapiens, functionally homo sapiens ‘stupideous’? Are we simply spiritual and moral runts? Are we wise-guys and not guys and gals who are wise? Regardless, we are quite the tribe–and without freedom, wealth, and addicted to power.